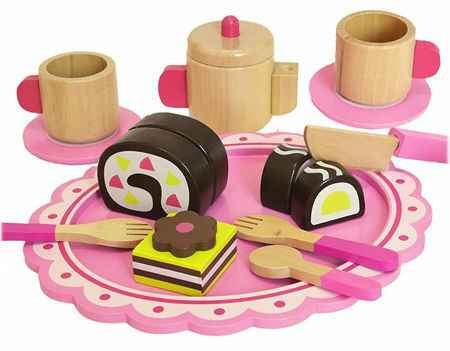 Wooden Afternoon Tea Set Pink is a beautiful pink 15 piece set on a tray with three cakes, cups, saucers, teapot and 4 utensils. This is a perfect pink set with a lovely spotty motif on all the tray. The tray is a great size for little hands and the cupcakes have painted on icing. This is the perfect way to have afternoon tea with your dolly, teddy and friends. Size: The tray is approx 23cm across. We like this because: "A wonderful set at a very reasonable price."